After the chance conversation on the hill the other day I could not resist posting this ! It had been a while since I had been out on any proper hills or adventures, time has been consumed by mountain bike sessions with the ungrateful youth of Glasgow. 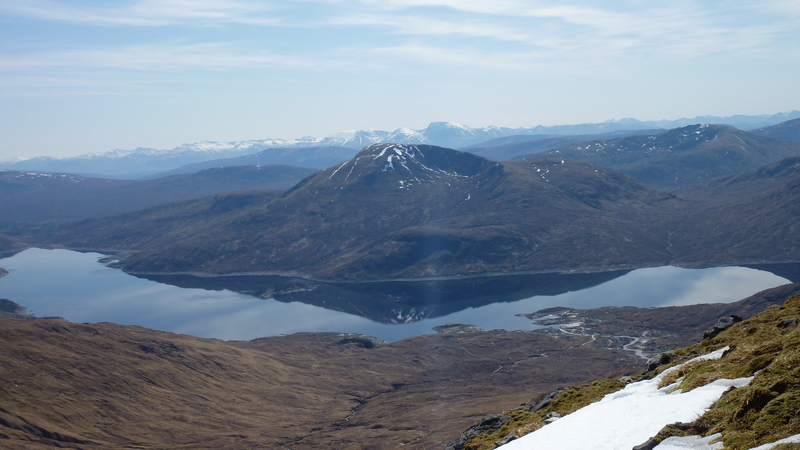 PTC had a few routes to do for Trail, one of them being Sgurr Mhaoraich in winter. With the snow retreating into patches he decided to do it asap. I had to work at the BBC Thrillseekers event on the Saturday so it was a late start when we met up at PTC HQ. We were team handed as Sandy and Elaina were joining us for this we jaunt. We trundled up the A82 in the PTC mobile, which was straining with all the gear and bods loaded into it. 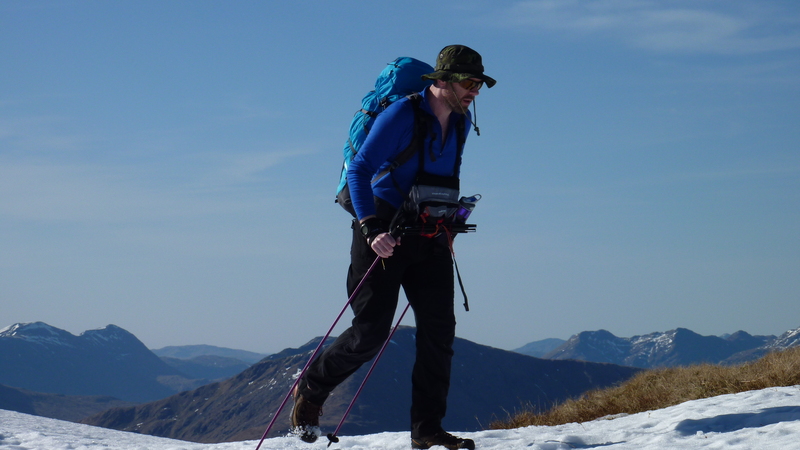 We stopped in Fort Bill for food and supplies, the wind was blowing taking the heat of the sun away, and I struggled to decide what kit to wear on the hill. 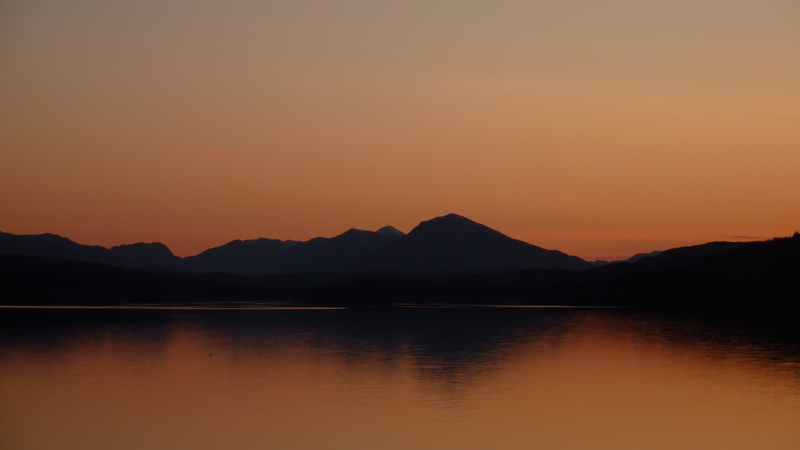 The sun was getting low as we followed the side of Loch Gary and wasnt long before we could not resist stopping for some pictures. There never fails to amaze me the colours that a blue sky and setting sun gives you and the fact it seems to be intensified when you are in the mountains. We pushed on till we got to the parking spot at the bottom of the track and started to kit up and get ready. 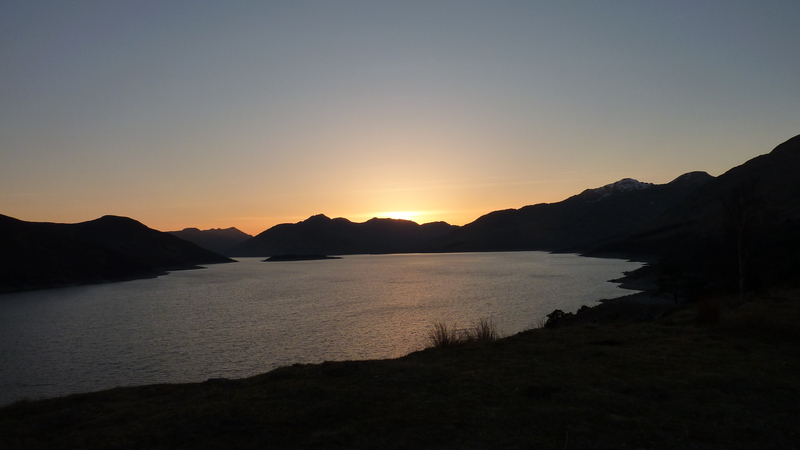 It was almost dark as we set off up the hill and the air was still warm. We set a good pace going up the track and stopped to chat to a guy who was just coming off the hill. 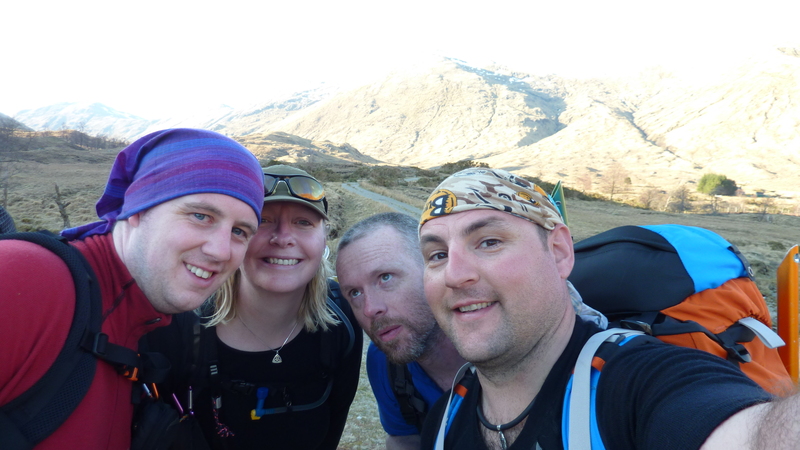 By midnight we reached a flatish spot and after a bit of discussion we agreed to set up camp. I had the Vango Helium Superlite 100 and initially struggled to find the opening for the pole sleeve, the other problem being the fly sheet is black and so is the ground sheet so you do struggle a bit to work out which way up it goes when you pull it out the bag. Tents up stoves were on and the roar of new gas canisters boiling water for brews soon filled the air. 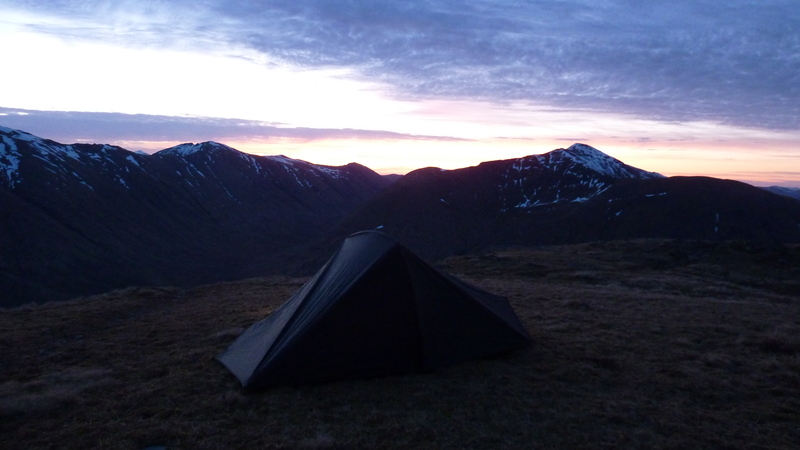 There was much banter but after an early start that morning I could not stay up and drifted off to my tent about 1am. 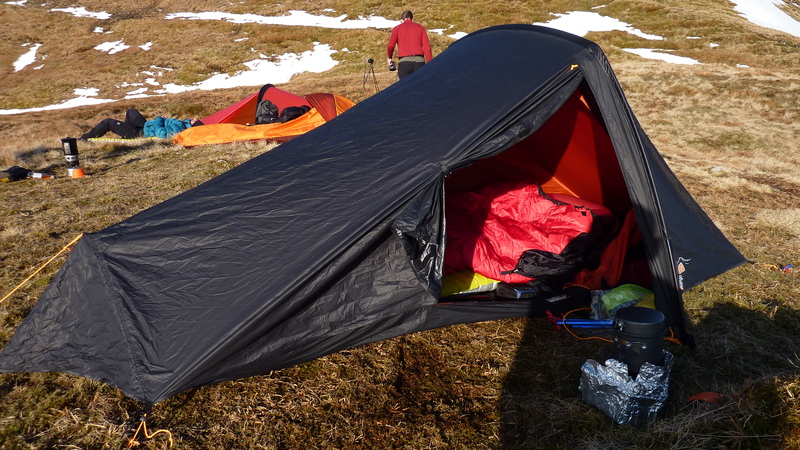 There was not a lot of room in the tent to get layers off but I eventually drifted off in the warmth of my PHD Minim 500. I woke about 2am and checked the watch, with the black fly sheet there was no way of telling if it was day or night. 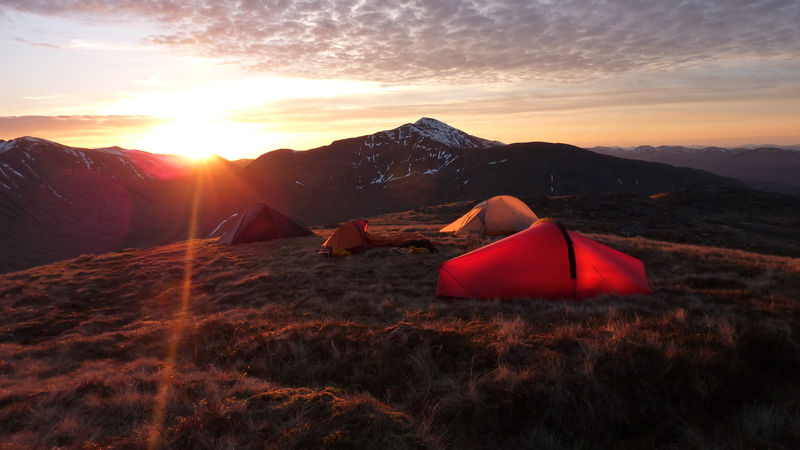 I woke again just before 6am to excited voices coming from the other tents. I unzipped the door and was greeted by an amazing view. Stoves were on again for brews as the sun climbed over the surrounding hills. We drank brews and took pictures some of us slightly more dressed than others. It was a great wee spot as the sun intensified and started to warm the air, the dappled clouds drifted slowly across the sky in front of us as we got ready to start packing up. 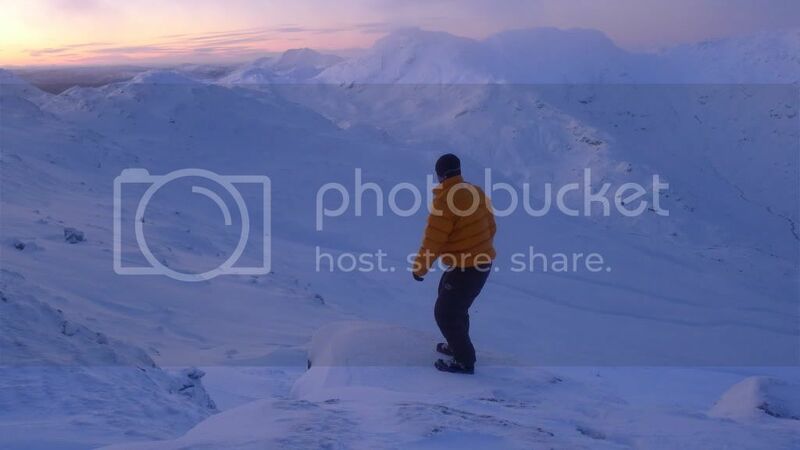 By 9am we were on the move climbing the ridge towards the summit. 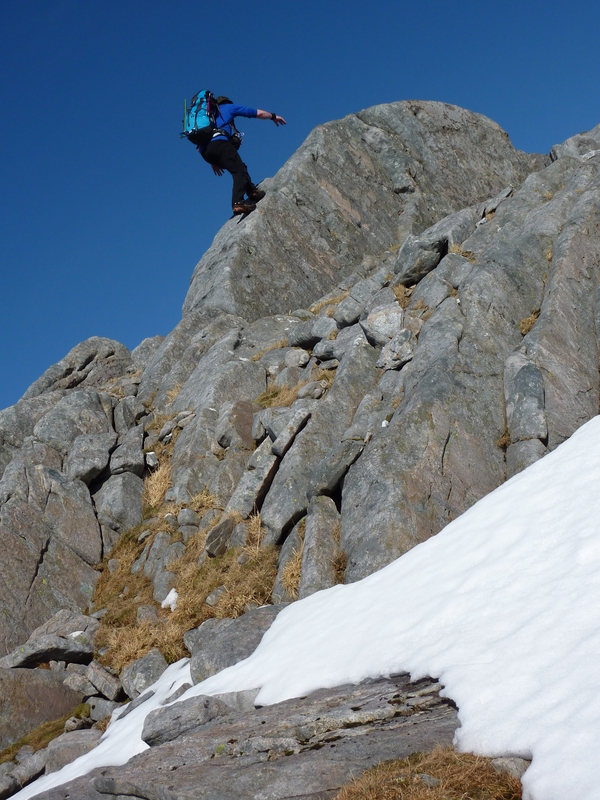 It was already warm and vents on trousers were opened wide, I already wished I had shorts on. 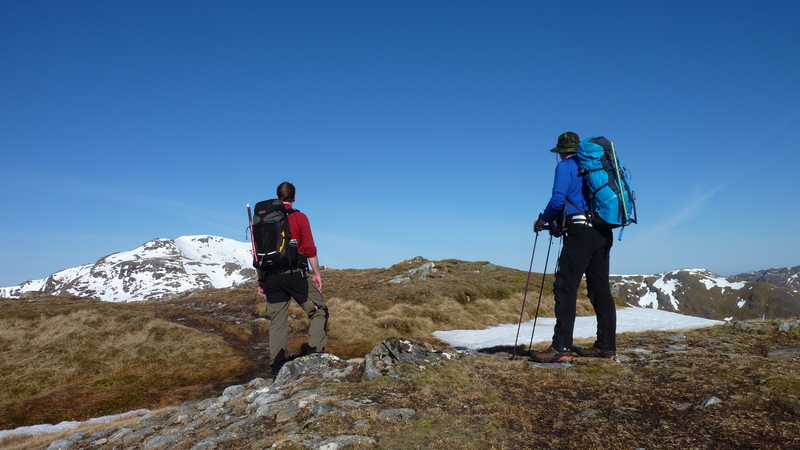 It wasnt long till we were crossing patches of snow, the patches were well consolidated with soft patches here and there. 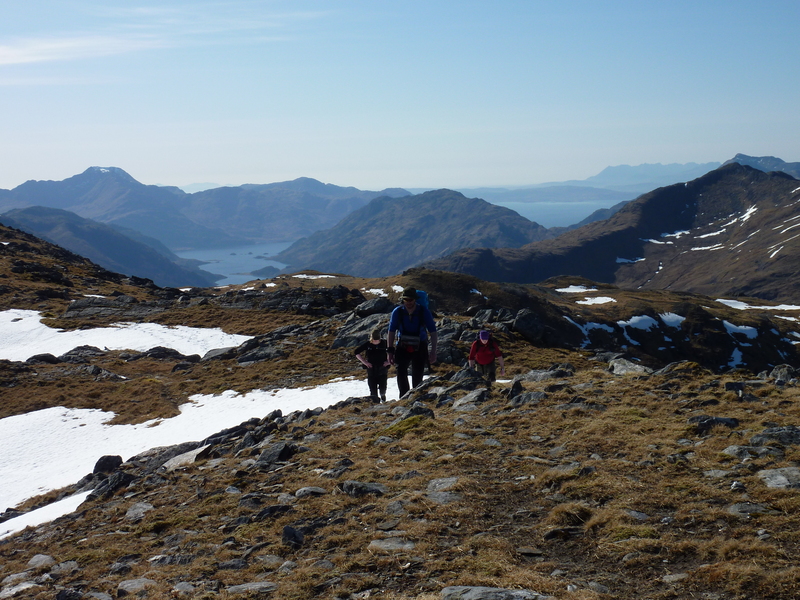 With warm sun amazing mountains and snow patches it really did feel like you were in the Alps as we plodded on bantering away with joy and laughs. The ridge started to get more rocky offering you a few a route choices, the rock offered amazing friction for the soles on the Trail mids 2 and you just could not resist having a wee scramble up some the jaggy rocks. 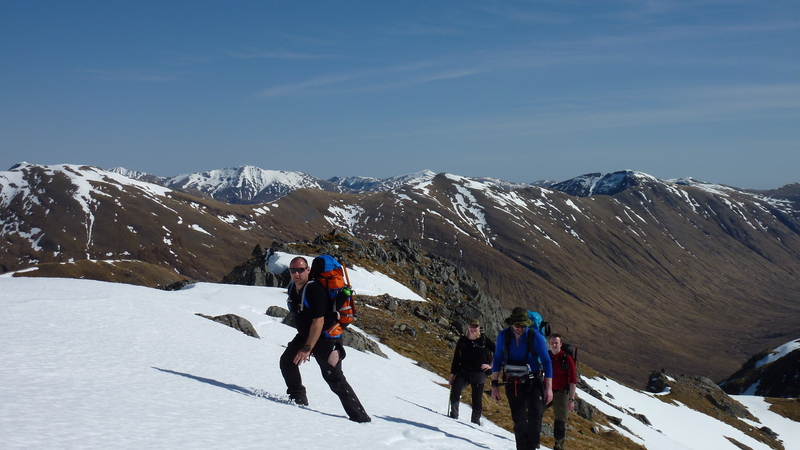 The ridge opens out offering yet more amazing views back towards Ben Nevis and the south Glensheil ridge. A slight breeze picked up and offered a respite from the baking sun. 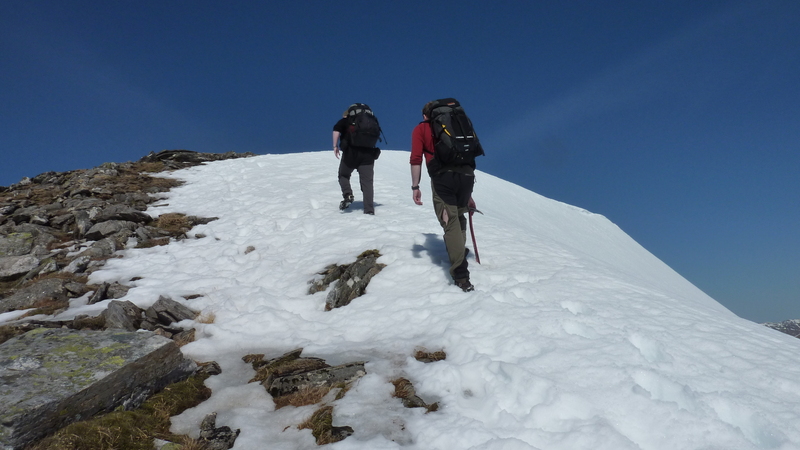 There was few challenging wee steep patches of the snow just before the summit. With the added bit of exposure it tested you technique and a bit of nerve as we ascended one by one. With every climb the views just got better and better as we could not belive our luck. 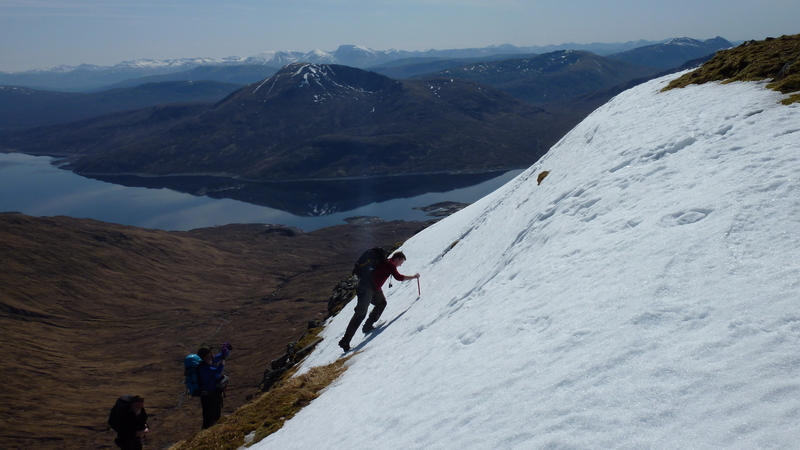 Axes were kept out for the last wee push to the summit on hard patch of snow clinging on to last bit of winter. The view opened up even more once on the top, you could see Sky the Cairngorms and Ben Nevis sitting proud with a cap of snow. 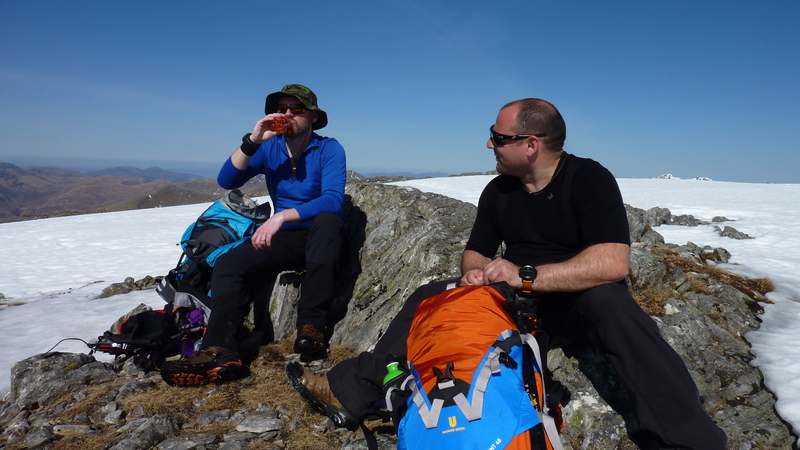 We sat down by the summit cairn not needing an extra layer as it was so warm. Water was being boiled and I doubled up with PTC for a cup a soup. 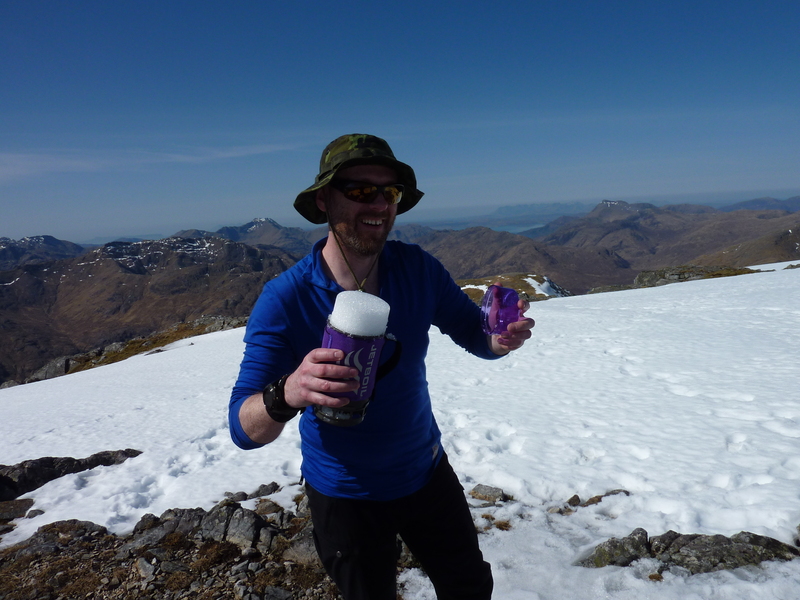 As we drank our soup PTC melted more snow for a cuppa, his Jetboil Flash looking more like a purple pritstick than a stove. As we sat taking in the view a couple arrived on the summit and drew us a dirty look as they stomped off in the other direction ! After an hour on the top we packed up, as I was about to shoulder my rucksack I noticed the bottom of the frame tube was sticking out the cordura at the bottom of the pack. This had also rubbed on my trousers causing a shiny patch, after a bit of pushing and shoving we managed to remove the frame which actually made the pack fit my back better and be more comfortable. 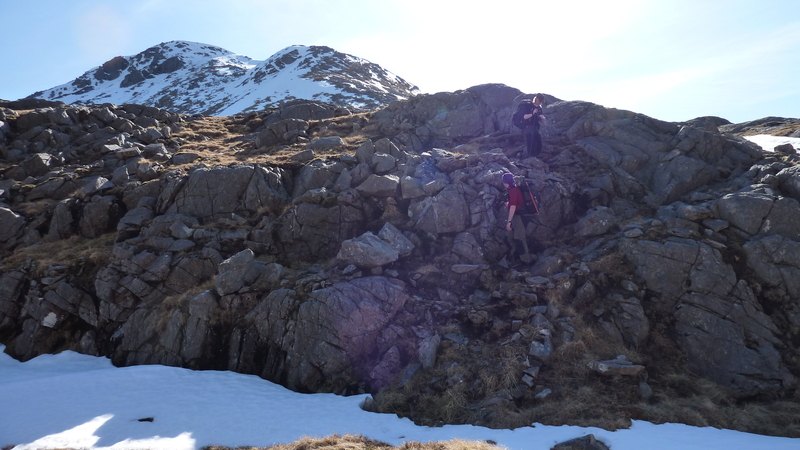 The climb down to the saddle was not an easy one, we had to pick our way through patches of boulders and loose scree as well as patches of steep solid snow. 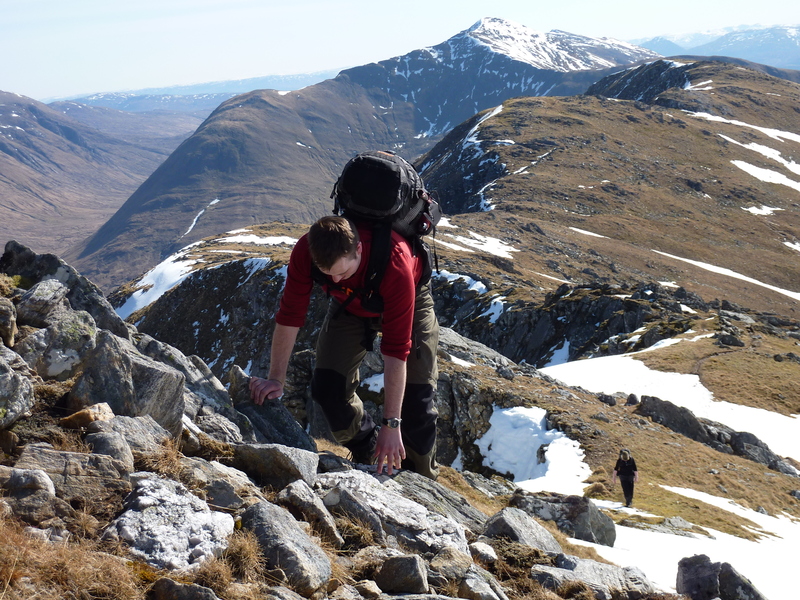 The climb back up from the saddle was short and steep, the rocks cut terrace like ledges into the hill side giving choices of routes upwards. Again we could not resist the opportunity to scramble on the rocks for an even faster height gain. Once on the top of Am-Bathaich we made good progress along the ridge, we were all starting to suffer from the strong sun light and Buffs were worn to save the day for Sandy and I. 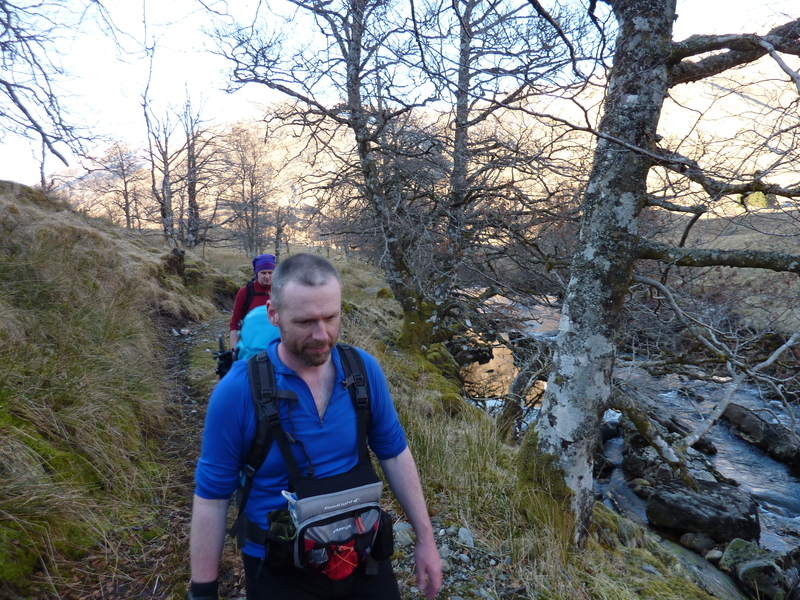 The down hill into the glen was a zig zag grassy track, after a while it became a tad tiresome and PTC ran off the corner shouting “Bored ” and jogging off down the grassy slope before sitting down in the shade and filling his hat with snow. We crossed the river via some stepping stones, Elaina opted for the wading option and while she took her socks off PTC and I decided to make the wading spot a bit shallower by throwing rocks in and soaking Sandy and each other. Once across we trekked down the path enjoying a different type of scenery. As we hit the main track back to the road we watched a stag roam around in the shade of the hill. There was much posing for the cameras as we took a team photo. Back at the car we changed out of hill gear and set off back along the road just in time for another great sunset ! Of course there was the A82 closure to contend with but I suppose there had to be some suffering !